Oopsie Daisy's in Loftus. Pic by Dave Charnley. A new children’s soft play centre and café has opened in a long-term vacant unit in Loftus, thanks to Redcar and Cleveland Council’s £2 million High Street Support Scheme. The scheme provides grant funding to improve shop or business units in Eston, Loftus, Guisborough, Saltburn and Redcar town centres. 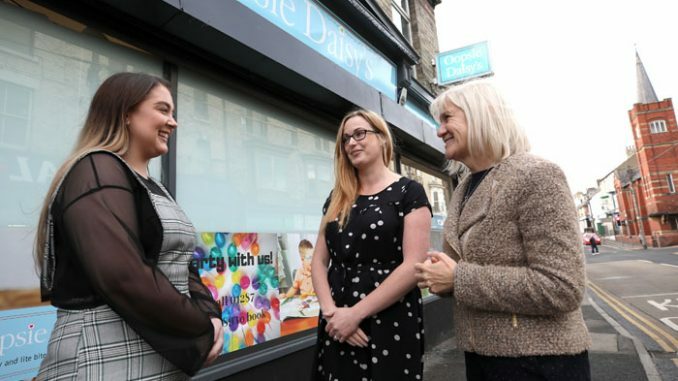 One of the first businesses to benefit is Oopsie Daisy’s – a soft play area for under 5s and café on Loftus High Street. Business owner Kelly Jones was able to fully renovate an empty property to bring it back into use after benefitting from a grant of £10,000. Kelly also invested some £20,000 herself. The building, which had been empty for two years, required a complete overhaul including new electrics and plumbing, damp treatment and installation of a disabled toilet, a staircase and a new floor. Kelly, 37, who also runs an Oopsie Daisy’s in Skelton, now employs 12 local people and has hopes to franchise her successful business in the future. Former bank employee Kelly, a married mother-of-two, said: “My business in Skelton has been running for four years now and is doing very well. “I want to scale the business up and am convinced it can work as a franchise model. To prove that it works, I needed to open a second shop myself so I asked my customers where they thought the second Oopsie Daisy’s should be based. Loftus was the winner. Councillor Sue Jeffrey, Leader of Redcar & Cleveland Borough Council, said: “Congratulations to Kelly. “To have gone from working in a bank to employing 12 people and running two successful shops, all while raising two children, is an incredible achievement. “Small businesses are the lifeblood of town centres, making a vital contribution to our economy and society.